While Installing BizTalk I received the following Error that Enterprise Single Sign-On should be installed manually. Well this had not occured while installing previous versions of BizTalk. So I was a little bit curious as to what am I missing on the Server. So I started installing the redistributable prerequisites manually as this is what BizTalk installation does first. After installing .Net Framework 4.5 from the .cab file I tried to run the BizTalk installation again as normal and selected the .cab file I downloaded. 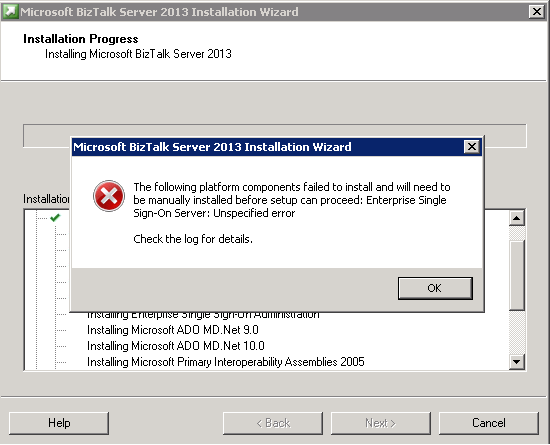 And it worked fine and BizTalk 2013 was installed successfully with Enterprise Single Sign-On and all other features. So seems Enterprise Single Sign-On installation needs .Net Framework 4.5 to be in place before it can be installed and BizTalk Installation is messing it up somewhere while installing the redistributable prerequisites.